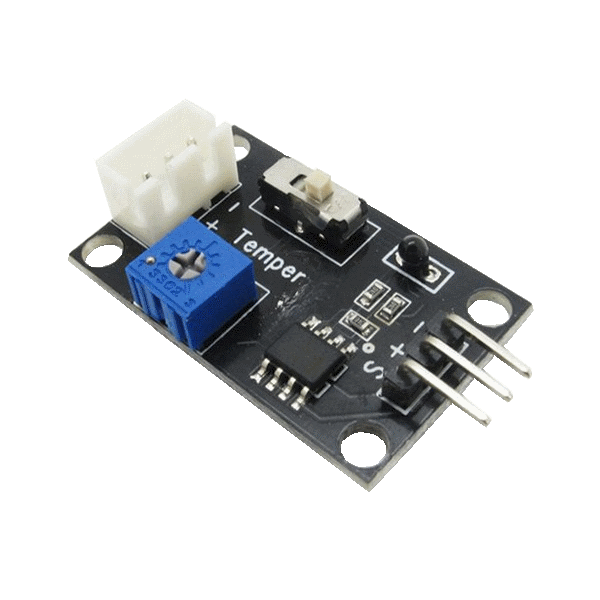 The Temperature Sensor Module uses a thermistor which returns the ambient temperature in the form of a resistance value, which is then used to alter Vcc. The temperature can be read as an analog value or set to trigger a digital signal when a threshold is reached. The operating range is -40 to 125°C , with an accuracy of 1.5°C. Connect the (+) and (-) to a 5V power supply and the output (S) pin to a analog or digital input on your robot's microcontroller. Use the switch to select between analog and digital modes. When in digital mode, use the potentiometer to adjust the temperature threshold. The output on pin (S) will be high when the temperature is above the threshold and low when it is not. When in analog mode, the voltage output on pin (S) will vary between 0-5V depending on the temperature.